Zefram, all the examples listed in the cross-sections book are old designs by Star Wars- maybe they fixed their heat problems- they sure managed to make hyperdrives smaller (judging by the ISD not having that giant hyperdrive sticking out the back like the Republic version and fighters not needing those rings). One of my biggest complaints about Star Wars is the pace of technological development. Each starship or starfighter class is supposedly an improvement on the last design. But how much technological advancement could you expect over a twenty year time span in a culture that has had faster-than-light space travel for thousands of years? You would think that technology would tend to plateau with the occasional quantum leap every few generations. As in-universe explanations go, the use of S-foils or large BOP-like wings for heat dissipation is actually a pretty good one. The only way to increase radiative heat transfer from an object in a vacuum is to either increase its temperature or to increase its surface area. As to Star Wars, yeah, the plateau in tech is pretty hard to fathom, unless the invention/ widespread implementation of Droids was relativly new thing before Ep I. (this kills all non-canon stories and video games like KOTOR though as thay use tech at least as advanced as the Empire's- even a thousand years prior!). It could be that older ships required very large crews to man and that "fighters" were much larger than what we're used to due to their command/control needs and large hyperdrives. It would also explain how the droid makers became such a political power. Also consider that nothing advances technology like a war- all sides rush prototypes into production, make refinments and then rush those into production too in an attempt to out-tech the enemy. I dont buy the heat-dissipation angle on the KBOP- I'd rather it had something to do with cloaking the ship than that. A larger surface area needed to cloak would also explain most Romulan designs having all that "wing" area. Rev, we did indeed bat the theory of "wings down to fire" on the KBOP but we disproved it: all the (ug) "larger" versions attack wings-up at least. The same threar showed that the wings can be down while in an atmosphere (during the KBOP raid on that Dominion base). Well I did say "aside from TNG" which is where all of those HUGE bops showed up. Even so, they were meant to be a different class (however dumb that may be) so the same rules need not apply. The thing I've never got with X/B-Wings and the like is that the explanations all seem to point out the advantages of opening the S-foils, such as increased fire coverage and heat disappation, but they never mention why they'd have them shut in the first place. Maybe a smaller "bubble" for Hyperspace? That's kinda mixing genres there but some treknobable could apply. I wouldn't leave too much sleep over the science involved in Star Wars, at it's best it's 90% style anyway. Having said that, I dare say the ships in question would be rather difficult to land if the strike foils were always deployed. If ease of landing was a consideration then the B-Wing should never have got off the drawing board. With the foils retracted it's just a large flat wing shape, making it stable is just a matter of weight distribution. But aerodynamic is not in the cards in any way. The B-Wing may fold up for nothing more than storage space or possibly there is some launch rail mechanism that kicks them out that way and they "unfold" in space to be fully operational. 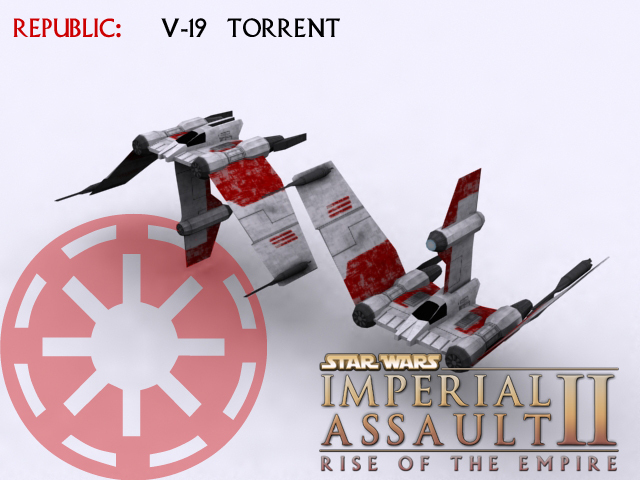 That V-19 Torrent starfighter from Ep. III rocks- it's third wing folds over the top when it lands. Kinds reminds me of the fighters from Stargate Atlantis (sans extra wing, of course). 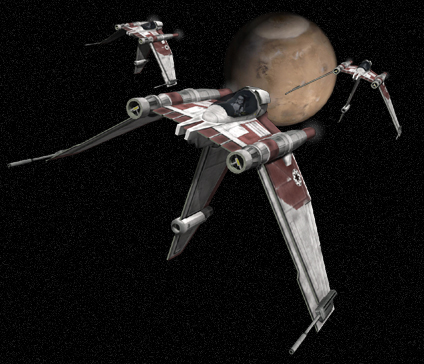 Actually, I think the V-19 only appeared on the Clone Wars cartoons (both the animated and CGI ones). I do like the V-wing fighter. It looks compact yet sturdy. Who said anything about aerodynamics? yeah but it just looks so damn unlikely- you'd need a large, very level piece of ground to land on every time. Or, you know, a hanger deck? Yes, but it you have a hangar deck, why need landing gear at all- they look tailor-made to be stored on racks of some sort- easier maintenence that way too....the gear is something thought up for the toy, then applied somehow to the design. Of course, it's all silly: in space repairs would be better served in zero-G.
Well a big flat metal square is a nice universal place to land, so I imagine most craft are designed with that in mind. Otherwise you'll be retrofitting your landing bays every time a new fighter comes into use. Of course they still could use specialised racks like TIE Fighters, especially on smaller dedicated motherships where internal space is an issue, or in specialised maintenance bays but they shouldn't be limited to that mode of storage.